This is a drawing of my great-great-great-grandfather’s place in Gallatin County, circa 1882. 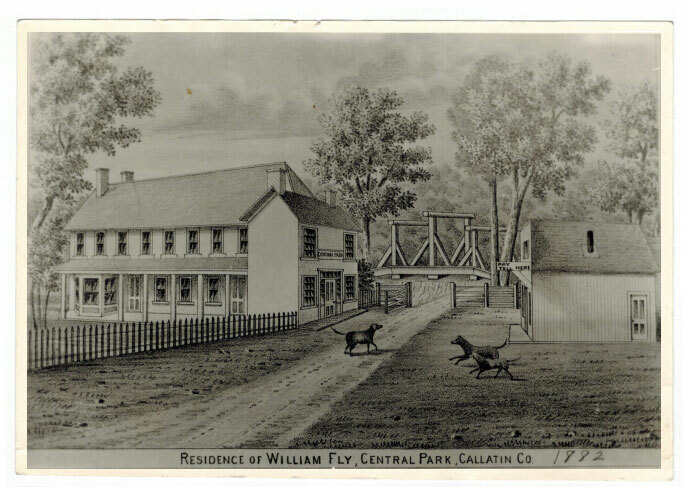 William Fly had a toll bridge across the Gallatin River and a horse breeding business. When the railroad came through Montana in the 1880s, the Flys started taking their horses to St. Louis by rail for sales (not as simple as it might sound, if you consult the route maps). Although The Home Place is in no way a portrait of the artist as a young lawyer, it rests on the foundations of my family’s own home places in Montana. My ancestors first saw what is now Montana in 1860, when three sons of the Curtis family left Wisconsin to scout for land just opening to settlement in the Northwest Territories. In 1864, they brought out the rest of the family to settle in what is now called the Gallatin Valley, near the headwaters of the Missouri River. The valley was a sacred hunting ground for many tribes. My great-great-grandmother, who grew up there, left handwritten journals about her childhood, including the story of standing beside the trail watching the day-long ride of the rich Nez Perce tribe with its thousands of ponies, riding to their winter meeting with their cousins, the Crow. I grew up nurtured on such stories. All of my grandparents grew up in rural southern Montana and northern Wyoming. Only one of them graduated from high school. I am a Rhodes Scholar with a doctorate from Oxford and a law degree from Yale. In spite of all that connects us, the cultural gap between their experience and mine can feel like a dark, dangerous crevasse. Sometime South Dakota poet Kathleen Norris has written about the harsh reserve of the high plains, and what happens when they produce a poet. Does the place destroy her, reject her? Or can the subterranean currents of creativity flow here too? I see how most artists go east or west, but I’ve always known that no source exists for me apart from this place. The Home Place is one in a long series of attempts, lasting most of my life, to get at that source in a truer way. There is no autobiography here except that every word is my own “cremated youth,” as Willa Cather put it, hieroglyphs for a life and a place. There were things I needed to understand about home and family, self and evolution, that could only be worked out the way I’ve always worked out things buried too deep to talk about: by writing them. Writing this book took at least a decade and more full rewrites than I can recall. It is no coincidence that during that decade I founded a legal nonprofit that serves northern plains communities facing the existential challenge of runaway fossil fuel development, or that I finally came home permanently to Montana. As I did these things, at night I took my imagination from its drawer, as a compulsion, the only way to integrate an ocean of experience. The Home Place is the result. The straightforward research I did was on the logistics of murder and criminal investigations, and the business of intergenerational ranch operations. I sidled up to a police chief, a neurologist, a pathologist, and several ranchers with my odd little questions. I visited a hospital morgue. I read Patricia Cornwell – not the sort of thing I usually pick up. The more important information had to be gathered more subtly. To allow my characters to work out things I needed to know – How do we come home? Where is the median between my life and my grandmother’s? Can achieving a dream become a form of insanity, as it unlinks us from reality? – I needed to give them myself. I could not cheat or fake the part of the story in which Alma, the lawyer come home, decides that Montana is where she must be. The tumultuous unpacking of everything she shoved aside in her fury to escape had to come out. Where the characters are true, that’s where I’ve broken through to the mottled soul of a place and people. Where they’re false, or incomplete, is where my own becoming is incomplete. The characters form little dialectics, set up against each other to push and pull. We learn about Detective Ray Curtis when he encounters subtle resistance in Sheriff Marx, and unsubtle prejudice in Brittany’s father. Chance Murphy gives Alma a model for returning, but his own return has been complicated and painful. Vicky and Alma are the penny with two faces: one lands up, one lands down. Why did it have to be that way? What forces acted on one but not the other? What deformed Walt and Helen’s souls? I studied the existentialists at Oxford. The only words I have to explain my writing sound like jargon to my own ear, terms of art, not terms of heart. Writing this story, across years in which I became someone different, has been my truest attempt at integration of all that life has led me through. A life is like that. There are so many mismatched pieces from different puzzles. Some of mine are to do with people from humble origins who try to speak something meaningful to the world, who see a broader stage. The puzzle pieces also link iconic places and images, the legend of the American West, with all the poverty, abuse, isolation, loss, violence, and despair that are equally real, equally part of the legend. In much of my legal work, I see a disconnected civilization operating on principles that boil down to raw greed, hurtling toward its own destruction. My creative project, far from fully realized, is a literature of connection, a poetry of place, that touches the instinct for rootedness in the most nomadic among us. It is an attempt to insulate myself from cynicism. What I want to bring into the world is a moment in which I, and my readers, brush up against what is slow, connected, integrated, authentic, complex yet genuine, driven by older and deeper loyalties than what moves on the surface of the waters today. I write to call my soul – and the souls of others – home, and to acknowledge what home really is. It is fitting, then, that my first published novel is The Home Place. Home is never perfect, rarely easy, but without the deep past, the genetic truth, evolution is impossible. Let us stand on bare earth with bare feet and know what we are, who we are, where and whom we come from. Then let us evolve.